Super gorgeous tiny kitten heeled shoes by Step. 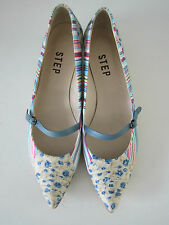 These pretty shoes have pintucked floral fabric uppers with candy striped sides. I have all my leather soled shoes pre-emptively soles to increa longevity. F9770- Ladies Svannah Textile Kitten Heel Court Shoes 2 Styles! Great Price! Very good Condition b ut Used. Authentic Gucci Pink And Green Stripe Bamboo Web Horsebit Heel Shoes £1110 New. Very fashionable Gucci heels. Bamboo web is in great condition. DUNE SLIP ON SHOES UK SIZE 7. MULTI STRIPED TEXTILE UPPERS. WE ARE LARGE ENOUGH TO COPE, BUT SMALL ENOUGH TO CARE. A sixties inspired shape, Tanya is a striking bar shoe with a discreet platform, set on a classic heel and finished with a Ruby Shoo signature flower corsage. River Island ladies shoes size 7. Condition good but is Used. Dispatched with Royal Mail 2nd Class. Dune Ladies Navy Blue Court Shoes. Striped print. Kitten, wooden effect heel. Uk Size 6. Soft upper. Worn for couple of hours indoors at wedding. Excellent condition. Very comfortable. Size: 41 EUR. Overall Good Condition. With white detail adorning the front for a glamorous finish. Adjustable elastic section in the back. Ankle Strap Buckle Fastening. 4.5” Stiletto Heel. Textile Upper. Man Made Sole. New Look, Wide Fit, ladies, white and navy, sailor stripe design, straw effect edging detail with underneath stitching, small platform, high cork effect wedge heel, round toe shoes. At the front of the right shoe there is a marking on the straw platform, see picture number 10. 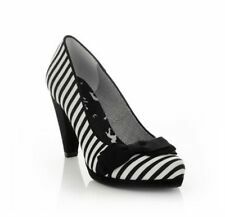 Red or Dead Multi Grey/Black Stripe T-Bar Shoes size UK 6 EU 39, heel height approx. Size: UK6. Classic zig-zag Missoni striped slingback shoes. Colour: Purple. Buckle fastening. ladies river island shoes size 7. Dispatched with Royal Mail 2nd Class. Including any defects I can see. ladies river island shoes size 7 . Condition is Used. Dispatched with Royal Mail 2nd Class.